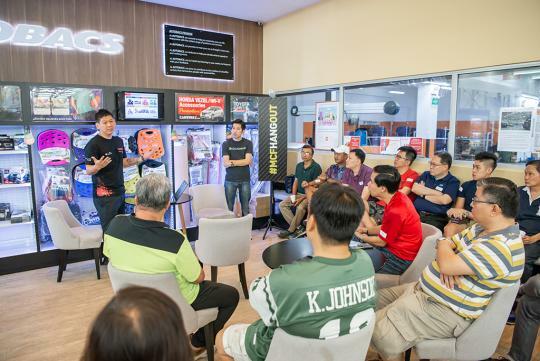 More than 30 MyCarForum (MCF) members gathered at the Autobacs Ubi outlet at Ubi View on Saturday morning to attend the MCF Hangout with Sonax. 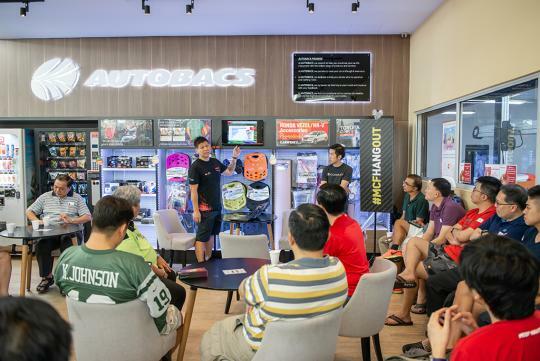 The focus of the event was to provide MCF members with the necessary knowledge and skills to care for their cars, and the range of Sonax products available. During the event, a representative from Sonax conducted a workshop on the importance of preventive maintenance for your car's exterior. 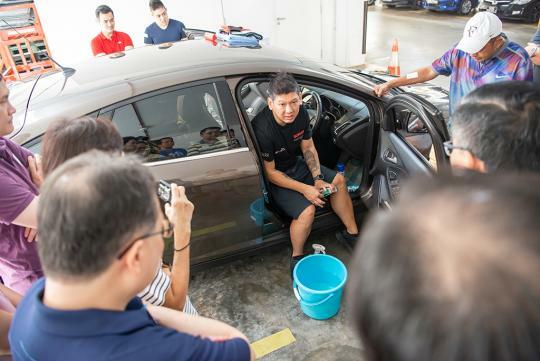 Thereafter, a hands on session was conducted to illustrate the proper ways to wash and clean a car, both for the exterior as well as the cabin. 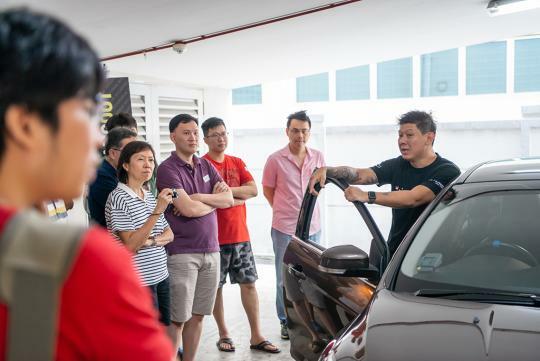 These tips included the proper methods of washing a car, the appropriate products to use to protect the car's paintwork, as well as tips on grooming the car's interior. Three Sonax products were highlighted during the MCF Hangout. The first is the Sonax Xtreme Wash+Protect Wash and Sealant. It is a car shampoo that provides a mirror shine, as well as a long lasting water and dirt repellant effect. 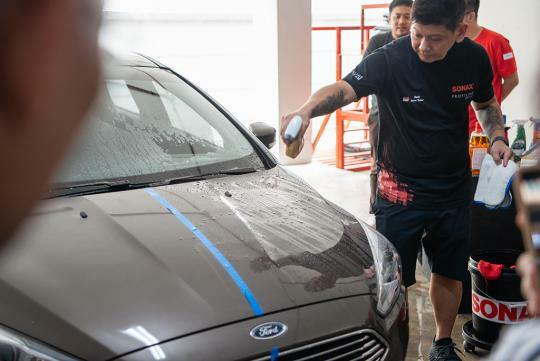 It can also be used on vehicles that already have a layer of paint protection to revitalise the water repellant effect. The second product is the Sonax Xtreme Spray+Protect Spray-on Sealant, a convenient spray-on sealant that offers lasting protection and dirt repellency. On top of the body panels, it can be used on your car's rims as well. 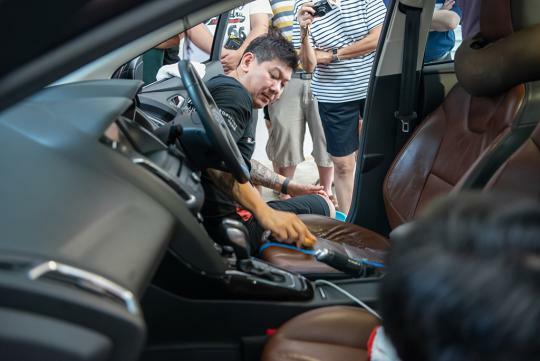 The third product is the Sonax Xtreme Leather care foam NanoPro, which is ideal for cleaning and conditioning leather seats and other leather interior fittings in the car. It removes dirt, oil and grease while simultaneously making the leather extremely supple, while real beeswax assures long term protection. It also contains no dyes, and can be used on leathers of all colours. 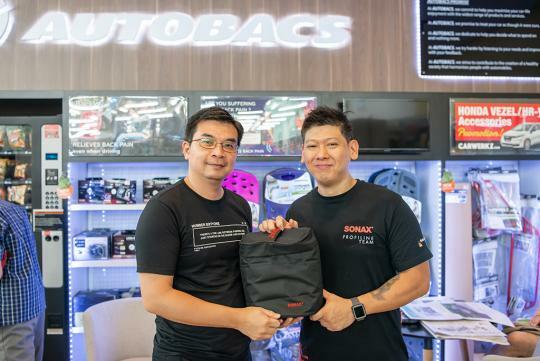 A lucky draw was also held, with the lucky winners walking home with Sonax products worth up to $150. 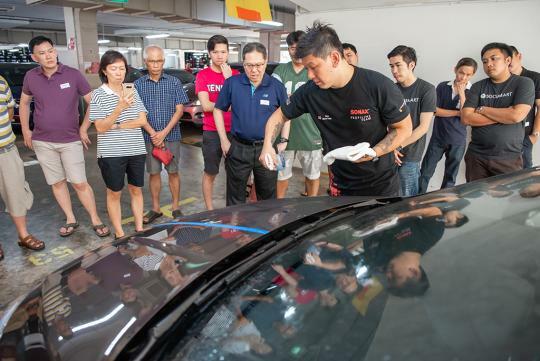 Davin from Sonax explains the benefits of paint protection products. 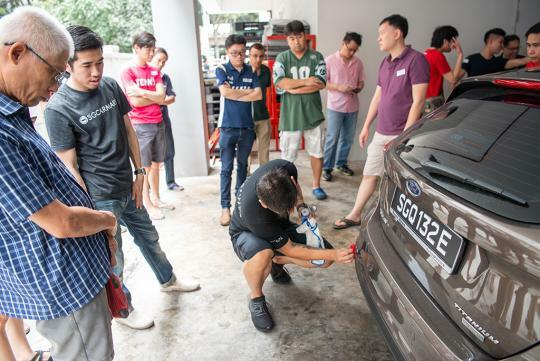 A hands-on experience to learn how car care should be done! The Sonax Xtreme Leather care foam NanoPro cleans, protects and nourishes leather seats. The water repellant effect of paint protection products prevents water spots from forming. Lucky draw winners walked away with Sonax products! great event to meet up and place a face to the nick as well as learn a thing or two on what not to do. how can i get notified to join? Hi, events are posted on our homepage so do keep a lookout on our homepage and quickly register as our events usually have limited spots!